Christianity is all about dying to ourselves. Some see this as hideous, onerous, and weak. "Why give up your desires, wants, and longings for something someone else mandates?" they wonder. "That sounds like slavery!" they charge. However, they fail to realize that surrendering our wills to Christ is like a bird surrendering to air currents or a fish to the water. When we surrender to the Lord, he gives us the power to be what we were made to be — enabled to be useful in ways that are eternal, empowered to have life not limited by mortal boundaries, and blessed by communion with the Creator as our Father. 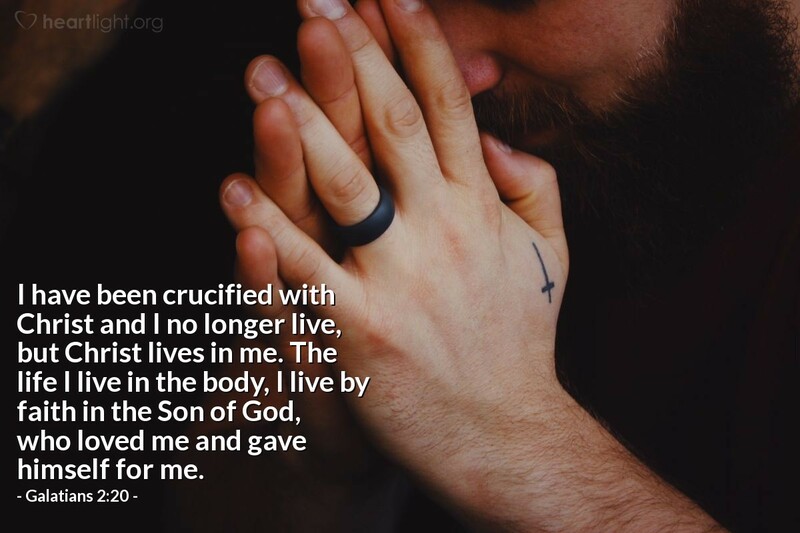 What is lost in this surrender to Christ living in us? Only our selfishness and our self-damage caused by rebellion. Holy Father, I thank you for your work in my life through Jesus. As you remake me to be more like your Son and my Savior, I trust that you will use me in ways far grander than I can imagine. Please take my heart and cleanse it thoroughly. Please take my life and use it mightily. Please expand my thoughts and help me dream more majestically. May all of this be empowered by your Son's life in me, and may all I do, dream, and desire be for your glory. In Jesus' name I pray. Amen.